(Nanowerk Spotlight) Among the many challenges that researchers have to overcome in developing bottom-up nanotechnology fabrication techniques and processes, the requirement for extremely precise, nanometer-scale control of positioning and shaping of objects is one of the most vexing. New work by a team of scientists in Korea demonstrates the position- and shape-controlled growth of nanoarchitectures using the selective growth of nanowalls with conventional lithography and catalyst-free metal organic vapor-phase epitaxy (MOVPE). This presents a significant advance towards the fabrication of artificial 1D and 2D nanomaterials as functional components in many integrated electronic and photonic devices. "I think that the most exciting scientific core of our findings is the observation of selective formation of zinc oxide (ZnO) nanowalls along pattern edges on gallium nitride/silicon (GaN/Si) substrates, which enabled us to control nucleation sites to grow nanomaterials in specific positions," Gyu-Chul Yi explains to Nanowerk. "We also applied the position- and shape-controlled selective growth of ZnO nanowalls to the growth of ZnO nanotubes with various desired shapes and arrangements. Moreover, since the position- and shape-controlled nanowalls and nanotubes exhibit almost defect-free single-crystallinity, these high-quality nanoarchitectures can be employed to integrate many devices including electronic and optoelectronic nanodevices on silicon substrates." Yi, an associate professor at Pohang University of Science and Technology (POSTECH) in Korea, is director of the National Creative Research Initiative Center for Semiconductor Nanorods at POSTECH. Together with collaborators from POSTECH and Seoul National University he developed this simple, precise, and well-controlled bottom-up fabrication method that shows great promise to be expanded to create many other novel architectures with diverse arrangements and morphologies required for various applications. The team has reported their findings in a recent issue of Advanced Materials ("Shape-Controlled Nanoarchitectures Using Nanowalls"). Yi points out that his team's work can offer a paradigm shift from two-dimensional to three-dimensional integration for more sophisticated and functionally integrated device applications. "Up to now, most research on semiconductors has been done to make flat and smooth thin films for fabrication of two-dimensionally integrated devices" he says. "However, even small lattice constant or thermal expansion coefficient mismatch between a thin film and a substrate makes it difficult to grow a high quality heteroepitaxial thin film on the substrate. In addition, films can be easily contaminated and damaged by lithography and etching processes. Accordingly, only limited kinds of devices have been fabricated on silicon substrates by top-down fabrication processes." Yi explains that it is still very difficult to grow almost defect-free, high quality GaN thin films on silicon substrates without using an intermediate layer, so that most GaN light emitting diodes (LEDs) have been fabricated on expensive sapphire substrates (see: "Heteroepitaxial Growth of High-Quality GaN Thin Films on Si Substrates Coated with Self-Assembled Sub-micrometer-sized Silica Balls"). However, the problem of material compatibility between a film and a substrate for a top-down approach could be solved using selective growth in a bottom-up approach. Nevertheless, the huge challenge of addressing the nanomaterials at specific positions on a substrate still remains. Since extremely precise controls in positioning and shaping nanomaterials are required for many nanodevice applications, the positioning of artificially designed nanomaterials is the most important issue in bottom-up approaches. 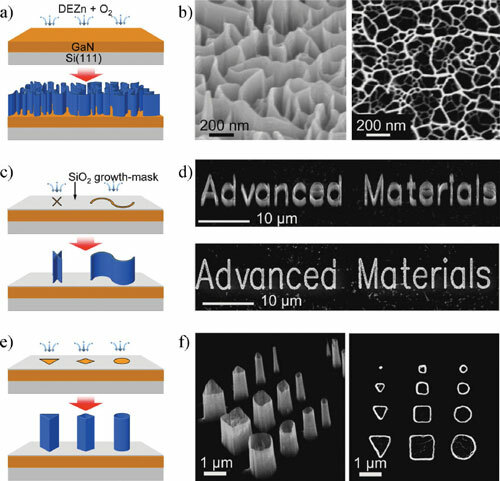 In their research, the Korean team observed that ZnO nanowalls can be grown along pattern edges on a very thin GaN layer coated silicon substrate, and they fabricated position- and shape-controlled ZnO nanowalls and nanotubes on these substrates. "As presented in our paper in Advanced Materials, we demonstrated that these materials can be used for field emission electron emitter applications," says Yi. "In addition to this device application, we have been working on LEDs and lasers fabrications on silicon substrates using these materials." In their future work, the team plans to demonstrate that these position-controlled nanoarchitectures can be very useful for many nanodevice applications. Yi explains that they recently have been working on position-controlled growth of nanotube heterostructures and quantum structures. "Our previous work on accurate controls of both compositions and layer thickness in nanorod heterostructures enabled us to observe the quantum confinement effect in ZnO/ZnMgO nanorod quantum structures ("Quantum Confinement Observed in ZnO/ZnMgO Nanorod Heterostructures")." "For example" he continues, "embedding quantum structures in a single nanorod allowed us to tune spectral wavelength continuously by varying the well thickness. Similar to the nanorod heterostructures, high quality nanotube heterostructures with well-defined interfaces could show quantum effects. In particular, coaxial nanotube heterostructures that are fabricated with composition-modulation along the circumferences of nanotubes can efficiently confine both carriers and emitted photons. This can make their optical and electrical characteristics much more useful than those of homogeneous nanostructures." As for device applications, the scientists will focus on realizing high efficiency light emitting devices based on their nanoarchitectures. "More specifically, we have been working on fabrication of position-controlled nanoarchitecture LED arrays based on vertically aligned coaxial nanorod/nanotube heterostructures that have quantum well layers on the cylindrical surfaces of nanorods or nanotubes," says Yi. "Position-controlled nanoarchitecture arrays with quantum structures can be very useful for LED microarray applications. These nanoarchitecture arrays enable us to take advantage of accurately controlling positions, thickness, and compositions of quantum structures embedded in the nanoarchitectures, all of which are necessary for fabricating high brightness LEDs. The controlled formation of quantum structures in the nanoarchitectures will significantly enhance the optical and electrical characteristics of the LEDs."